December was an excellent month for BTC Geek in terms of traffic. Even though the price of Bitcoin settled down into the $700s and the volatility fell drastically with it, the interest in Bitcoin and other crypto-currencies remained high. I am happy to report that this was the month with the highest monthly visits since the blog started, so I am happy with the way things are going. And unlike the previous months, there was no one single article that stole the show – I got a uniform traffic to a variety of different posts, spread throughout the month without too many ups and downs. That was 33,046 Visits; 26,080 Unique visits; 42,332 Pageviews. 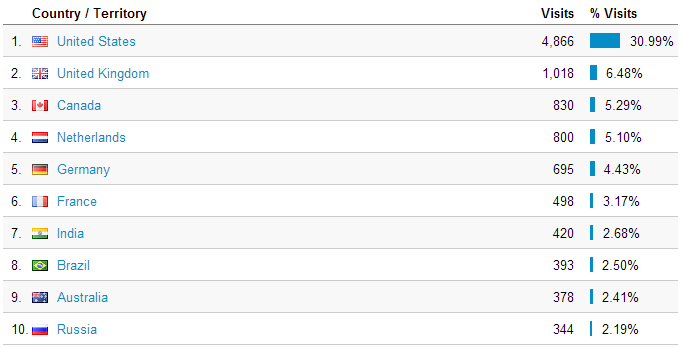 First off, notice that there is no homepage in the top 5 visited pages! Each of these were ‘viral’ in their own way, and they stand on their own merit. I am glad the top 5 were individual articles on this blog. My Free Bitcoin guide continues to attract traffic. I need to update the information on the page this month. Of course, the sudden rise in popularity of Dogecoin helped my article about how to Buy Dogecoin. I expect this traffic to decrease next month, for obvious reasons. 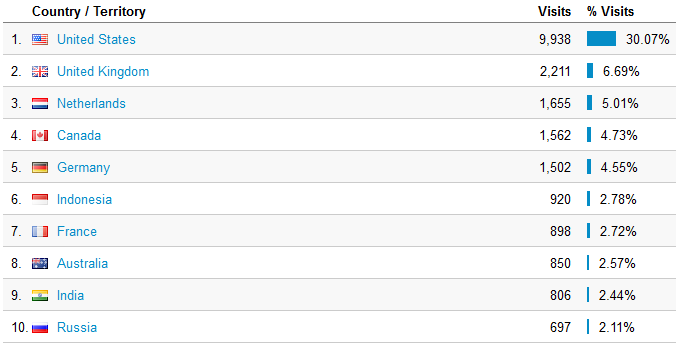 I very much enjoy finding out where my readers are coming from, which is also a good indication of how things in the Bitcoin world are moving around the globe. Bitcoin has the potential to better the lives of the poorest and most marginalized sections of society, so it is always good to see Bitcoin making inroads into other countries. 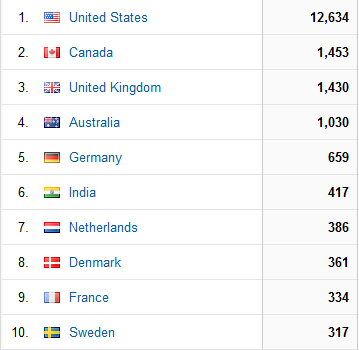 India has been in the top 10 for my blog for the last two months, and it has continued to do so in December. However, I was very happy to see Indonesia in the list this month. The US remains firmly on the top, followed by UK. Can the Netherlands dethrone UK next month? City-wise, for the first time, London beat New York and is on the top of my list. I don’t know why I have so many (not set) this time. 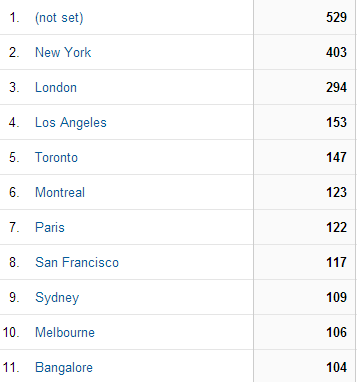 Google Analytics can be missing a few data points like the city information. 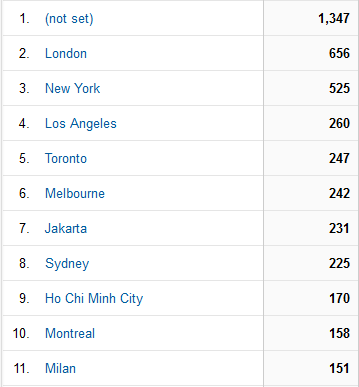 Really good to see Jakarta and Ho Chi Minh in this list. Bitcoin needs to spread to all parts of the world. That’s all from this month’s statistics. Don’t forget to find me on Facebook and Twitter to keep up with the latest updates. What a month November has been for Bitcoin! It passed the magical $1000 mark for the first time, and then, for a brief moment, crossed the price for 1 oz of Gold. All these are of course just psychological factors that hardly affect the overall development of Bitcoin, but it helps in the adoption as more and more people get to know and hear about Bitcoin. This blog also saw an increase in traffic associated with organic search results. The traffic was, however, less than in the month of October, but that was mainly because of one specific article that went viral. Crazy viral. However, the median traffic has been greatly improved this month, and I think this will sustain in the longer term. 10,00-15,000 visits should be the norm going forward. … a more fair distribution of traffic as compared to October where one of the posts had over 70% of the traffic. One interesting addition is Russia at number 10. I know Bitcoin and other crypto-currencies are popular in Russia, but my blog is completely in English. This probably means the number of actual Russian users must be much higher, as they would be looking for information in Russian. If anyone volunteers to translate a few of my posts into Russian, let me know! Bangalore is an interesting addition to the list, probably because I covered the first Bitcoin conference in India taking place in Bangalore (btw, there will be a representative of BTC Geek in Bangalore, so drop by and say hi!) This is an interesting and exciting development. Bitcoin is well suited in the Indian context and hopefully in the coming years there will be a lot more development and adoption of Bitcoin in India. Another month, another leap for Bitcoin. This was October though, before the crazy jump in BTC prices measured in sovereign currencies. I had a busy month, and I know I am a month late here, but I wanted to continue sharing my statistics for the blog. It is an exciting time to be blogging about Bitcoin and crypto-currencies and I fully cherish this wonderful opportunity of being able to reach tens thousands of people every month. October has been the biggest month for me, in terms of traffic so far. This was almost exclusively due to one post that went viral – Dawn of Autonomous Corporations Powered by Bitcoin. 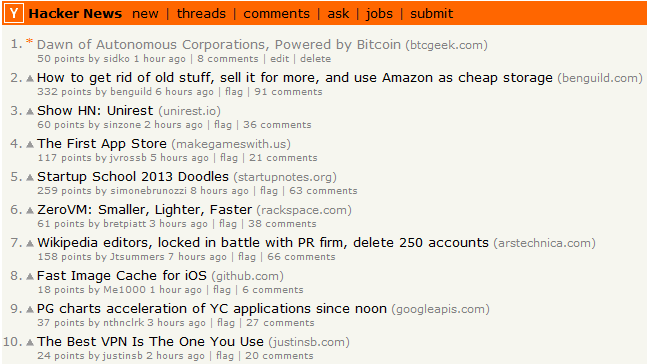 Yes, this post reached the top spot on Hacker News! That single post currently has 528 Facebook Likes, 305 Tweets, 197 G+ shares and 53 LinkedIn Shares. That’s what happens when one of your post goes viral – it made up more than 70% of my total views. I also reached more countries than last month – 41 more countries to be precise. This is a great improvement. It is also good to know that parts of the world that are not very well connected over the internet happen to be the ones that would benefit the most with an innovation like Bitcoin, and they are getting on-board. Australia was in the top 10 this time, and good to see India was hanging in there. Although it is a very unfair comparison, India could be the next destination where Bitcoin should take off. The one good thing about India is that instead of just speculating craze, it could grow more organically as the entrepreneurs there would be more interested in grass-root level implementations and solving problems unique to India. 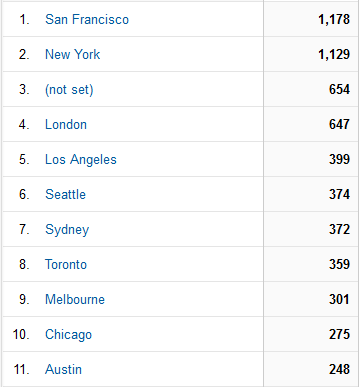 San Francisco, New York, and London retain their spots as first, second and third respectively. LA and Sydney moved up. And great to see Austin here! Austin is an under-rated tech hub in the US that has a lot of potential to grow in the Bitcoin space. One, there is plenty of intellectual capital. Secondly, there are a diverse bunch of people in Austin who can definitely help grow Bitcoin in different dimensions. And third, Texas is a stronghold of libertarian ideals, and Bitcoin is quite popular in the libertarian circles. That’s all from my side. If you like to see any other specific stats, let me know! I am continuing with providing monthly statistics of my blog. There are several interesting statistics that I think I can share with you that can also provide insights into the Bitcoin universe in general. The number of visits was a little over 5200, which is a first of course. The number of unique visitors came close to 4300. The big story for this blog was calling out a glaring error on the part of Wired when the wrote an otherwise very good piece on how the homeless can use Bitcoin to survive, except that it is probably not the brightest idea for everyone. The reason the article seemed so plausible was that it inflated the expected earnings by a factor of 10. Try asking your boss for that kind of a raise. GPT industry is discussed to death and I won’t go into the details here, but suffice it to say that you should do your (right) math in terms of your time and money you earn before getting into the industry. France and Brazil joined this list while China and Russia are out. Netherlands is still on the list. 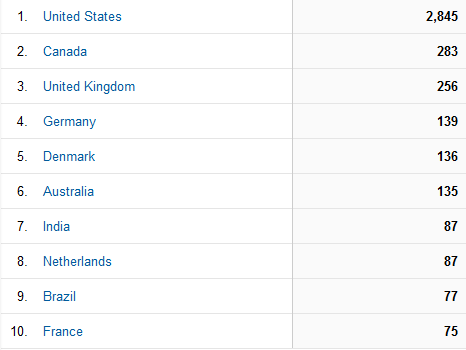 The top countries in the month of September for this blog were US, Canada, UK, Germany, Denmark, Australia, India, Netherlands, Brazil and France. Finland unfortunately didn’t make even the top 25 this time around, but it’s Nordic neighbor Sweden came in at 12th. Again, this is significant because of the population. I’ll run a per-capita visitor analysis sometime to dig deeper into this. 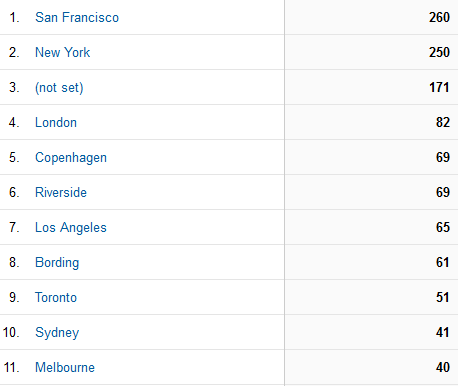 The list reads San Fransisco, New York, London, Copenhagen, Riverside, Los Angeles, Bording, Toronto, Sydney and Melbourne. Copenhagen is right up there at 5th, which is quite interesting. Lots of cities from California. San Fransisco has greatly narrowed the gap between itself and New York. I also published 12 posts in the month of September. 7. Will Bitcoin Become a Nation’s Currency? Any other kinds of statistics you’d like to see? Here are some interesting monthly statistics for BTC Geek that I think my readers would appreciate. Lots of interesting things happened in the Bitcoin world and this blog. The major breakthrough was that BTC Geek broke a story that Bloomberg is testing a Bitcoin ticker, XBT, internally. That single blog post got 60 Facebook Likes and 69 Tweets. This was also a month where BTC Geek finally went social – Facebook and Twitter! You can now see my Facebook page or follow me on Twitter. 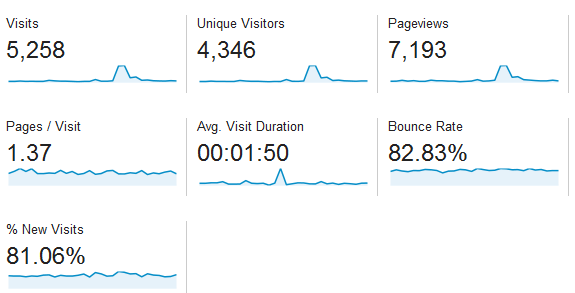 There were a total of 4904 visits, 4242 unique visits and 6876 pageviews in the month of August. Not surprisingly, the post above was the most popular. Location-wise, I am always curious to know where my visitors are coming from, and I think it is a good indication of where Bitcoin is becoming more and more popular. 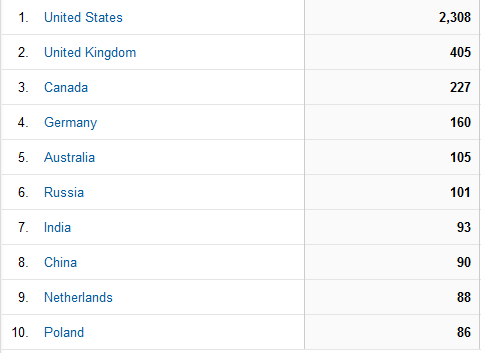 The 10 most popular countries, in that order, were US, UK, Canada, Germany, Australia, Russia, India, China, Netherlands, Poland. However, there is a very interesting country on the 11th spot – Finland. It’s interesting because the population of Finland is about 5.3 million and therefore per capita, it is much higher than most countries mentioned above. If anyone is from Finland reading this blog, contact me and I’d love to talk with you about this! It’s not just the countries though, but the cities which make it interesting. There are several cities around the world that are leading the way in Bitcoin. 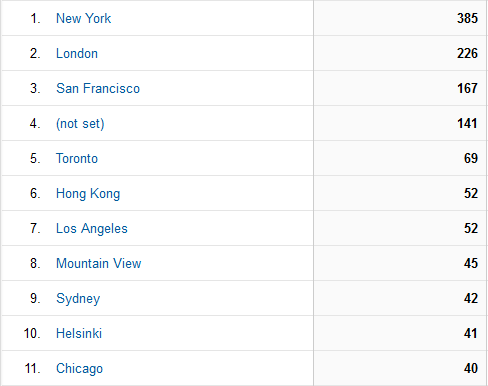 The list is: New York, London, San Francisco, Toronto, Hong Kong, Los Angeles, Mountain View, Sydney, Helsinki, Chicago. Starkly missing from the list is Berlin. I thought Bitcoin was very popular in Berlin. Where are all my Berlin readers! Helsinki is an interesting spot on the list – the capital of Finland. Also, New York beat out London.